The license [in Russian, patent] system for foreign nationals seeking permission to work in Russia was introduced in 2015. The cost of a work permit has varied from one region to the next. In Moscow, for example, it initially cost 4,000 rubles a month. In 2016, the price rose by 5% to 4,200 rubles, and in 2018, it rose by 7% to 4,500 rubles. It is absolutely necessary to have a work permit. Without it, a migrant worker faces up to 7,000 rubles in fines, expulsion from Russia, and a ban on entering the country for a period of three to ten years. Employers who hire employees without work permits are punishable by fines, and their operations can be suspended for up to ninety days. Something important happened on November 21, 2018. The Moscow City Duma approved a law bill increasing the cost of a work permit in Moscow. In 2019, it will rise by 500 rubles (11%) and cost 5,000 rubles a month (approx. $75). The next day, November 22, Moscow Mayor Sergei Sobyanin said the city’s revenues from legal migrant workers had been growing and would exceed 16 billion rubles ($241 million) by year’s end. 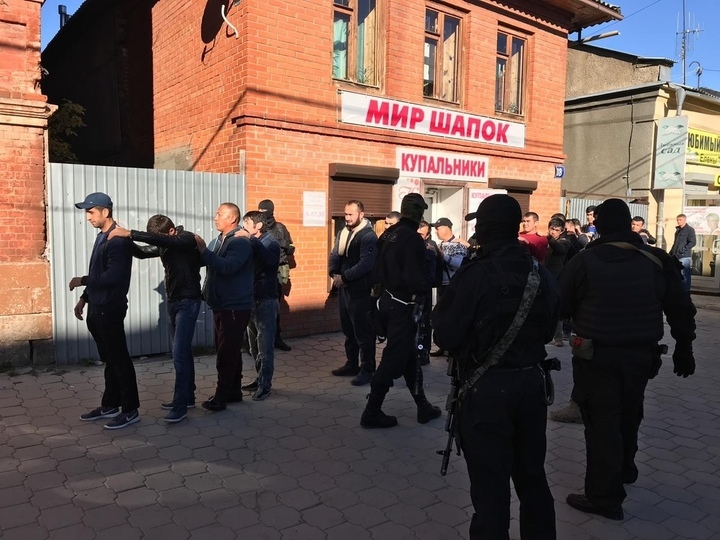 “By paying such a high price for permits, migrant workers have come to occupy a fair position vis-à-vis Russian nationals [rossiyane] working in Moscow, because in the past they paid nothing at all, and, of course, it was profitable to employ them, but the situation has changed today,” said the mayor. 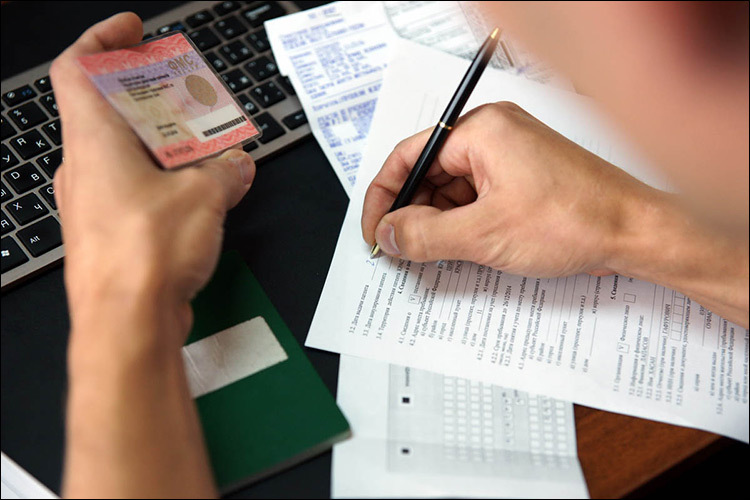 On January 1, 2019, the cost of a license for migrant workers seeking employment in Moscow Region will increase by 450 rubles. The Moscow Region work permit, which cost 4,300 rubles ($64.60) in 2018, will cost 4,750 rubles ($71.50) per month in 2019. Taras Yefimov, chair of the Moscow Regional Duma’s budget, finance and tax committee, said the measure would enrich the region’s coffers by around one billion rubles [approx. $15 million]. In 2018, Moscow Region made six billion rubles [approx. $90.5 million] on migrant work permits. St. Petersburg has decided to raise the price of the work permit from 3,500 to 3,800 rubles a month. City officials noted the decision was made because foreign nationals had begun earning considerably more money. Svetlana Salamova, director of Migranto.ru, a website for migrant workers looking for jobs and employers seeking to hire migrant workers, has not seen the real growth in the wages of migrant workers that officials have cited. “The wages of foreign nationals who are employed on the basis of work permits has remained at the level of 29,000 rubles to 35,000 rubles [$435–$525] a month. Maybe the Moscow authorities are focused on high-profile specialists who make 168,000 rubles a month officially?” Salamova sarcastically wondered. Salamova has noticed wage increases only among Kyrgyz nationals. After Kyrgyzstan joined the EAEU (Eurasian Economic Union), employers offered them 40,000 to 45,000 rubles a month. “But they work without permits. (EAEU nationals can work in Russia without permits as long as they have an employment contract — Fergana News.) 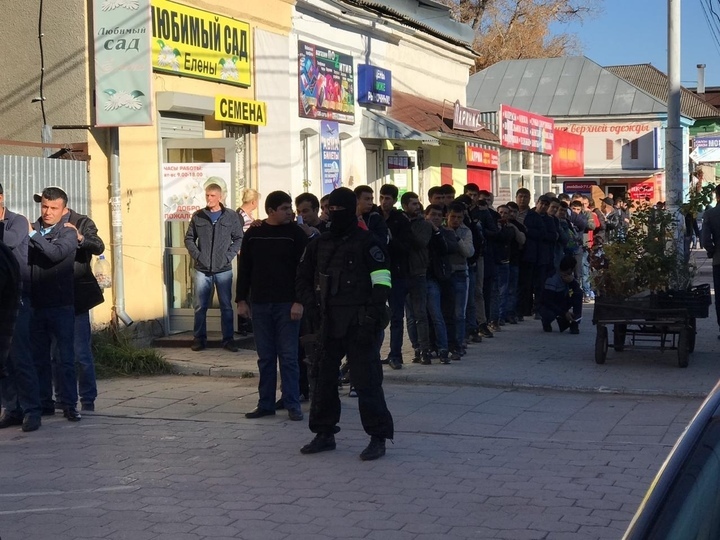 Besides, many Kyrgyzstanis agree to low wages of 19,000 to 20,000 rubles a month. They work part time in several places at once, and so ultimately they make a decent amount of money,” explained Salamova. Salamova did not discount the possibility that fees for work permits have been raised in light of the fact that employers must index wages for inflation as of the new year. Perhaps the authorities decided to increase the cost of permits for foreign national because they took into account this indexation of wages on the Moscow job market. But what do migrant workers themselves have to say about it? “Since 2015, the fee for the work permit has increased three times, but I have not even once received a raise. We spend little as it is: 4,500 rubles for the permit, plus the fee for residence registration; 6,000 rubles on rent, 5,000 on groceries, 2,000 on transportation. I sometimes buy clothes and medicines, and there are unforeseen expenses, like when my phone stops working. So, I have only 10,000 rubles left over from my monthly salary of 35,000 rubles. The latest 500-ruble increase will definitely affect my expenses. 6,000 rubles a year is a lot of money: an average family in Tajikistan could live for a month on that amount. 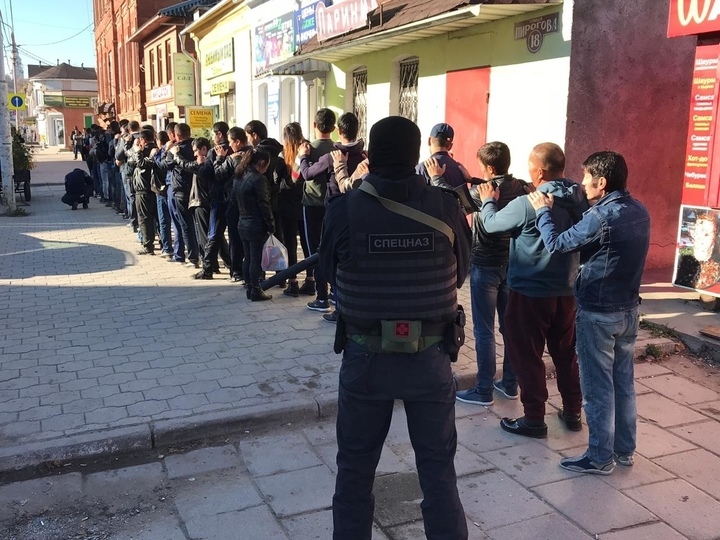 It means my relatives back home will have to get by one month of the year without receiving a remittance from me,” said Magomed, who comes from Khujand, Tajikistan’s second-largest city. In June 2017, Mayor Sobyanin said the problem of illegal migrant workers in Moscow had been solved and had ceased to be a source of concern for Muscovites. Most migrant workers were employed legally and duly paid their taxes. Experts believe the increase in the price of the work permit could lead to a rise in the number of foreign workers who decide not to pay taxes. “The cost of the work permit will increase by 11%. An extra 6,000 rubles a year might not seem like a huge amount of money. 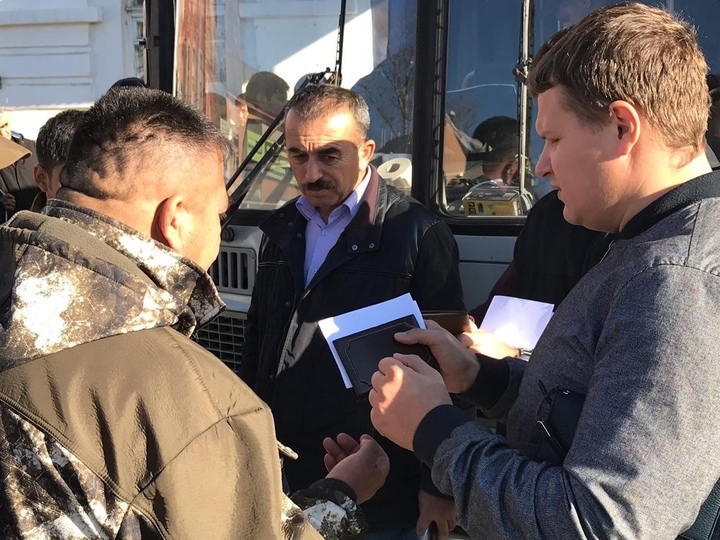 But for migrant workers, who earn this money literally with their blood, living far from their families, and undergoing numerous hardships and risks, this is not a small amount at all: the overall cost of a permit for a year will be 60,000 rubles or $900. Some migrant workers will thus decide to go off the books. Consequently, Moscow’s budget is unlikely to get a huge boost, but the city will be supporting a policy of pushing migrant workers into the gray economy with all the attendant social consequences,” says Professor Sergey Abashin. “It is odd that Moscow MPs say we will start earning more. Every migrant worker pays around 12,000 rubles to get a work permit in the first place. Then every month he pays for the work permit and his residence registration, he pays the rent, and he buys groceries. He even has to pay bribes to the police. People are taking money from us at every turn. What will we have left to send home?” said Muhammad, who is originally from Samarkand. Batyrzhon Shermuhammad, a lawyer and founder of the website Migrant, also sees no signs of a wage increase. 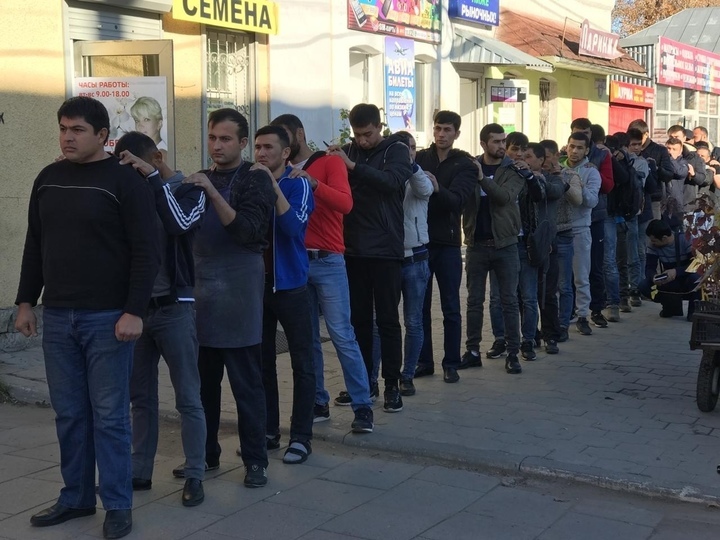 “If you look at the want ads, you will see that the wages of migrant workers who are employed on the basis of work permits range from 25,000 rubles to 35,000 rubles a month. We monitor the job market, and no one mentions anything about a salary of 40,000 rubles a month. On the contrary, the economic crisis in Russia has been deepening. There is inflation, and the dollar/ruble exchange rate has been rising, which affects the remittances sent by migrant workers,” Shermuhammad said. The latest increase in the cost of the work permit will force migrant workers to retreat into the shadows, he argues. “One could understand the increase if the economic situation had improved, but the trends are negative: the prices in shops have increased, and the dollar has become more expensive vis-à-vis the ruble. People have no money, and so they have been having problems with residence registrations. Also, by law you cannot be late paying for your work permit even by a day. If a migrant worker is paid his wages late, he cannot pay the fee for his work permit, and he has no way of shelling out approximately 12,000 rubles to have a new work permit drawn up. While introduction of the work permit system brought migrant workers out of the shadows, the subsequent tightening of immigration laws and the increase in their expenses has been leaving migrant workers with fewer chances to stay legal, even if they would want to,” Shermuhammad said. “Even though I make good money, a 6,000-ruble increase in the price of the work permit is a serious expense, and I have huge expenses aside from the permit. My mother, sister, and I pay 33,000 rubles a month for a place to live. That is 11,000 rubles per person, plus utilities. In addition, I have to pay the fees for my studies twice a year: that is another 100,000 rubles each time. We don’t spend a lot on food, no more than 10,000 rubles per person a month. I also spend money on transportation, clothes, and gifts, and I spend 5,000 to 7,000 rubles a month for English lessons. Lately, we have not been sending a lot of money home, $200 to $300 per month at most. Mom and I used to be able to save money, but in the last six months our expenses have skyrocketed, and after the new year they will increase even more due to the work permit. 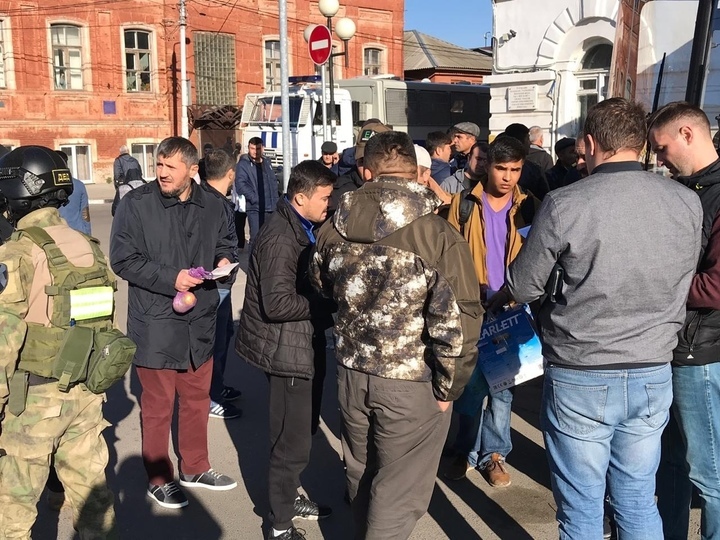 Basically, the increase in the work permit fee means I won’t be able to pay for English lessons for a month,” said Ilkhom, who hails from Tashkent. Yorov argues that raising the cost of the work permit will make migrant workers not want to pay for it, meaning that revenues to Moscow’s coffers will actually decrease. “Migrant workers will prefer to work without a permit and cross the border every three months. 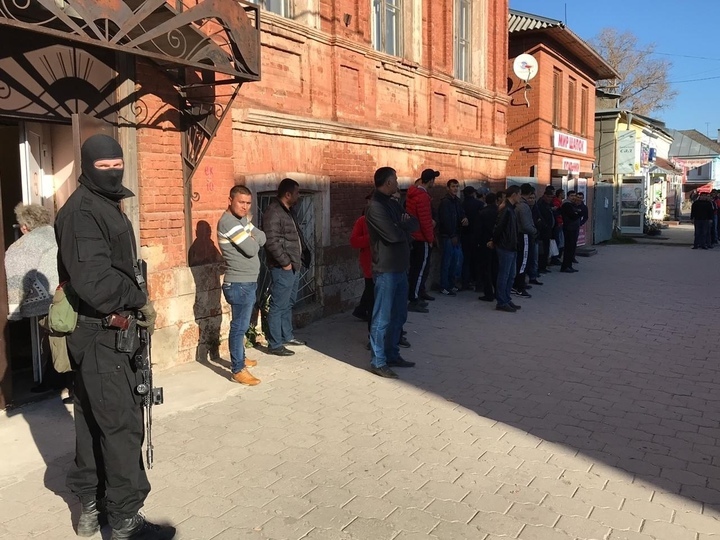 Currently, a trip to the border and back (i.e., exit and re-entry) costs 8,000 rubles in total, while the cost of a work permit for three months is 13,500 rubles, meaning they save 5,500 rubles by exiting Russia and re-entering it. This comes to 22,000 rubles, plus 12,000 rubles for the initial paperwork. The total is 34,000 rubles, which is the same as the cost of round-trip plane ticket to Uzbekistan. When you do the maths, it makes more financial sense for migrant workers to be off the books. The authorities themselves are forcing migrant workers underground, especially now that the laws on immigration registration have been tightened. Whether you get a work permit or not, if you do not live at the address where you are registered, you will be deported. Migrant workers will emerge from the underground only when the law on immigration registration has been abolished,” Yorov concluded. The total checks of migrant workers in Tula have moved beyond the Central Market. 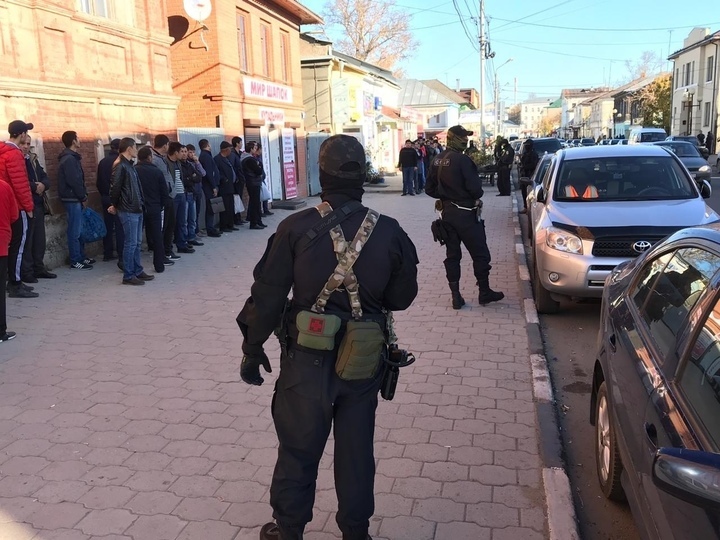 According to Moskovsky Komsomolet in Tula‘s correspondent, law enforcers from the Tula Regional Office of the Interior Ministry, the riot police (OMON), the Rapid Deployment Special Force (SOBR), and the Russian National Guard have inspected the streets adjacent to the market. 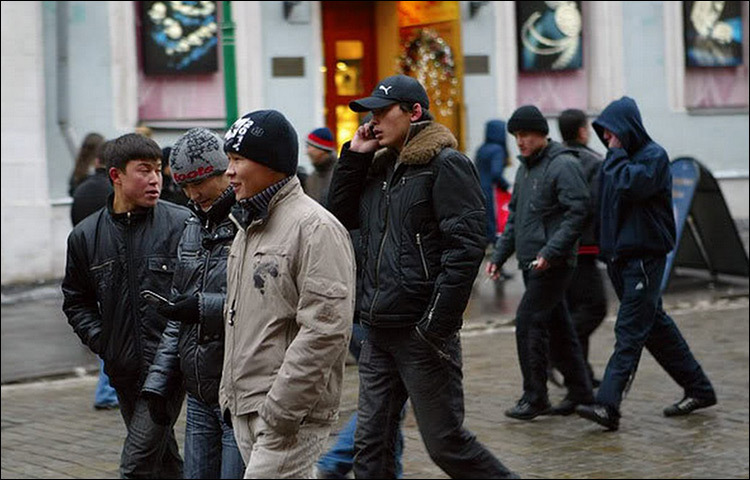 In particular, visitors from the Asian republics [sic] were also checked on Pirogov and Kaminsky Streets. Law enforcers looked to see whether people had documents [sic], residence registration stamps, and work permits. Approximately two hundred migrants workers were formed into a long column that grew longer by the minute. Checks for violations of immigration laws proceeded apace. 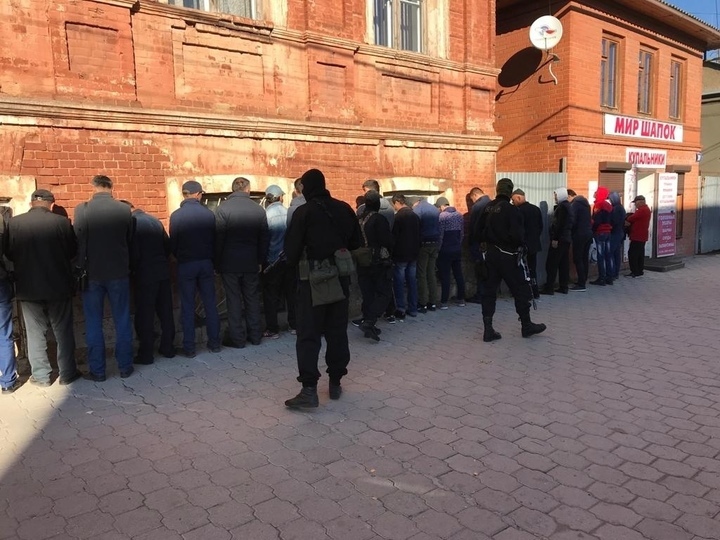 The total spot checks for illegals [sic] in Tula started at 10 a.m. on October 20, when law enforcers descended on the Khlebnaya Square area en masse. The entire market was cordoned off. All photos courtesy of Moskovsky Komsomolets in Tula. Translated by the Russian Reader. Thanks to Sergey Abashin and Valentina Chupik for the heads-up. 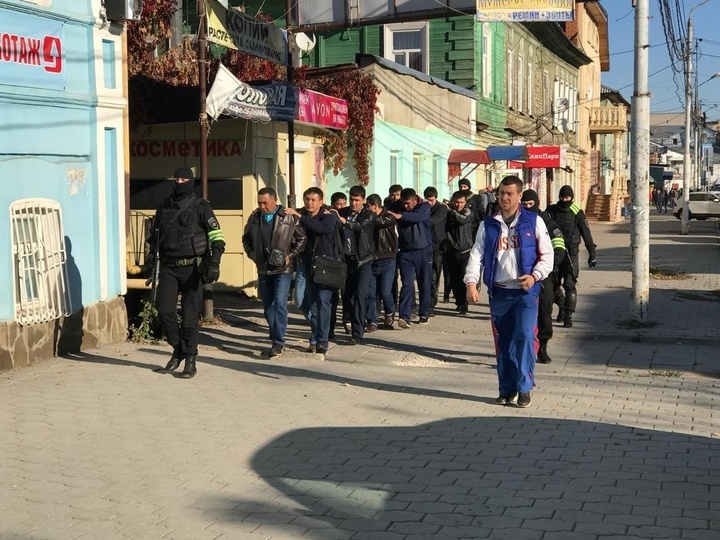 So-called law enforcement officers have long ago turned shaking down migrant workers—something literally every resident of every major city in Russia has seen with their own eyes thousands of times in recent years, but which they have “disappeared” along with most of society’s supposedly intractable problems—into a land office business, that is, a source of easy, quick cash. 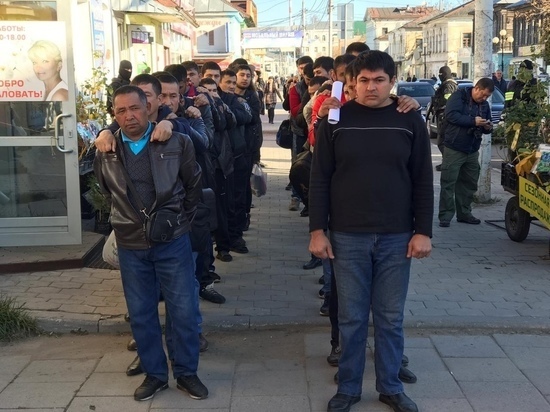 In any case, as likely as not, most of the men shown in the photographs, above, probably had all the papers they needed to live and work legally in Russia, including residence registration papers and work permits. 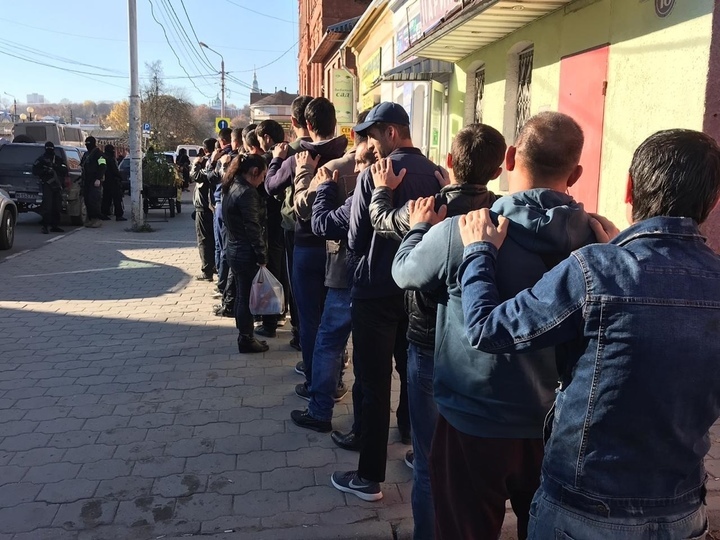 Unless they have temporary or permanent residence permits, they would have to renew these papers every three months in a process that is every bit as wasteful, time consuming, and humiliating as yesterday’s dragnet in Tula. 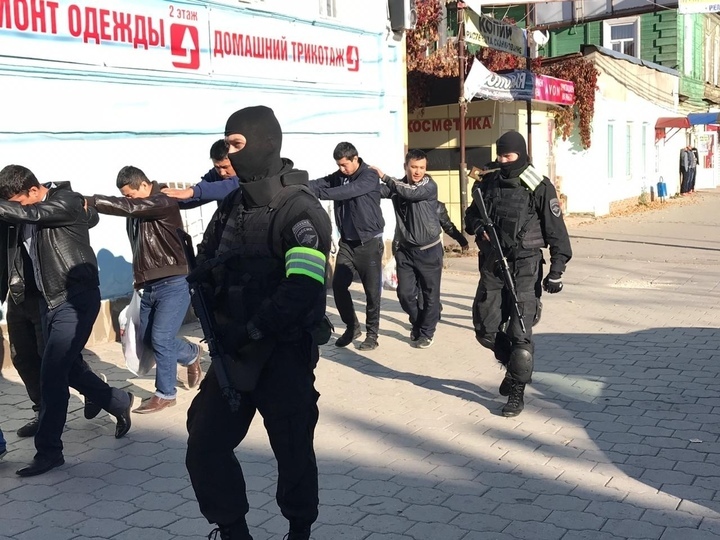 To add to their woes, the top brass of Russia’s dizzying of ever-proliferating, interwing, and competing law enforcement agencies and secret services regularly trot out cooked-up stats showing, allegedly, that migrant workers commit either an outsized proportion of all crimes in Russia or the majority of crimes. Human rights advocates can easily punch holes in these barefaced attempts to generate moral panics while simultaneously proving the police state’s continued indispensability, but these counterarguments rarely if ever get the audience enjoyed by Moskovsky Komsolomets, a mass-circulation national tabloid, based in Moscow, that for many years now has published local supplements in Russia’s numerous, far-flung regions. Owned until 1991 by the Soviet Communist Youth League (Komsomol), Moskovsky Komsolets abandoned whatever socialist and international principles it had long ago, opting for sensationalism and high circulations. According to the BBC, the newspaper had an average issue readership of 1,215,000 in 2008, making it Russia’s second most read newspaper, after Argumenty i Fakty. Given its heavy internet and social media presence, those readership figures have certainly only gone up in the intervening years. MK, as it usually styles itself nowadays, perhaps to make us forget about its humble socialist origins, was also identified in 2004 by the Sova Center and the Moscow Helsinki Group as the leading purveyor of hate speech amongst Russia’s national print media outlets. Certainly, yesterday’s “photo essay” in MK in Tula was an attempt to whip up a moral panic while boosting readership. The newspaper, however, is not primarily responsible for the fact that Russian officialdom and to a certain extent, Russian society at large demonizes, terrorizes, and racially profiles the cheap, supposedly expendable immigrant workforce that keeps the perennially flailing Russian economy afloat. Central Asian migrant workers hard at work on a roof in central Petersburg on a Sunday in early May. Finally I’m writing again about migrant workers, a subject that right at the moment interests very few people. Data on remittances by private individuals from Russia to other countries for the first quarter of 2018 has been released by the Russian Central Bank after a great delay. Here is the picture they present. Uzbekistan was the leader among the CIS countries. Its nationals remitted $726 million, which is 17% more than in the first quarter last year. Tajikistan came in second place with $487 million, which is 15% more than the same time last year. Kyrgyzstan took third place with $434 million, 9% up from the first quarter last year. The figures thus show a significant increase in remittances, which testifies to an growth in the wages paid to migrant workers and an increase in the numbers of migrant workers themselves. 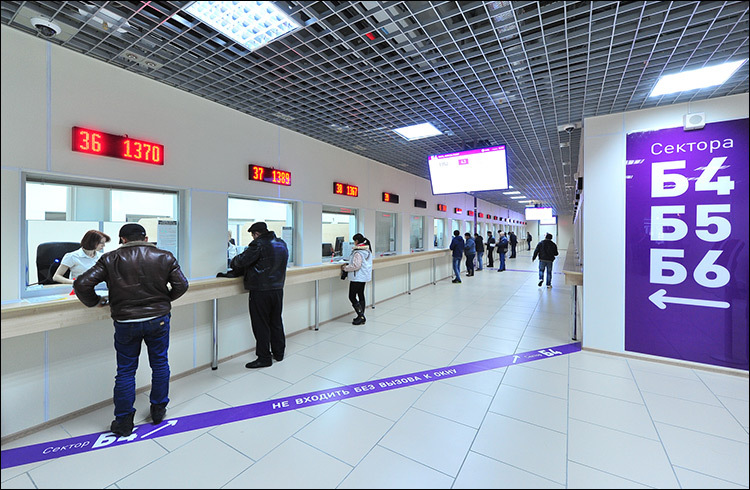 Remittances to Kyrgyzstan have been growing more slowly, but in fact that means a large portion of the money earned by Kyrgyz nationals now stays in Russia to be spent on setting up their lives here. P.S. By the way, the champion in terms of private remittances received from Russia is Switzerland—to the tune of $1.7 billion. “I very often hear from smart and even progressive colleagues, not only so-called conservatives, that we should not exaggerate. The regime, they say, has not cracked down on millions of people, and you can criticize it, albeit on the internet. There are protest rallies from time to time. Intelligent books are published, not burned, and monuments to Stalinism’s victims are erected. The west has many of its own faults, too, and generally speaking, the regime is not all that oppressive. “When the Russian Federation occupied Crimea, Russians celebrated. When Donetsk and Lugansk were shelled and captured, they encouraged the vampire and cursed the Ukrainians. When the Russian Federation bombs Syria, our vast country’s deaf inhabitants are out of the loop. “But why do they got upset when their own children are poisoned? 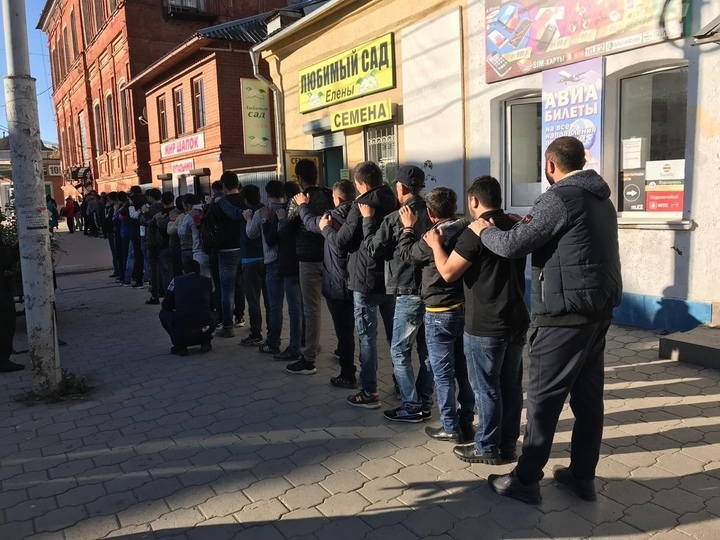 Are the children of the Crimean Tatars, made orphans, and the murdered children of Ukraine and Syria worse than the children of Moscow and Voronezh? “As long as you agree to kill others, don’t expect happiness. Your actions will catch up with you, sooner or later. “According to Mikhail, closing the British Council would deprive Russians of the opportunity to learn about British culture, study English, and attend lectures, seminars, and other interesting events. The really hilarious and sad thing is the number of Russians who are convinced that, because they are “victims” of their own regime, the so-called west (the EU, US, etc.) owes them something, everything. Unfortunately, there have been a good number of Russians who have fled Russia for just these reasons in recent years, and many of them have been granted asylum, as they should have been. But there have been many more Russians who have simply left the country for a better life somewhere else. Or it would be cool if more or most Russians extended the same right to live the good life to other peoples. But even as they either live happily in the west or think hard about relocating there, which they regard as an entitlement and a birthright, many of them are horrified that Europe, the US, Canada, Australia, etc., have been “overrun” by Muslims, Mexicans, Africans, Indonesians, etc. The entitlement to a good life does not extend to these people, even if some of then, namely, Syrians, have been fleeing their homeland because the Russian government has allied itself with the Syrian dictator Bashar Assad to crush all opposition to his tyrannical dynasty and been bombing the last opposition strongholds to smithereens with its superior air force and firepower. I don’t need to tell you how many refugees, displaced people, and asylum seekers the Assadist massacres in Syria have generated, but Russia itself has taken in only a handful, at most, of these refugees, and caused them a lot of problems in the process. Meanwhile, wherever they are in the rest of the world, at home or abroad, a good number of Russians would deny refuge and asylum to these same people because, in their mind, they are all potential “Islamic terrorists” or otherwise incompatible with “western civilization,” whatever that is and as if Russia were indubitably a part of it, an imaginary construct. This same sense of entitlement extends to the mostly jejune “battle with the regime” at home. Of course, there are lots of Russian grassroots activists and opposition politicians who fight the good fight without even once thinking about “the west” and what it can or should do for them in their uneven struggle with the Putinist tyranny. But there are just as many Russians who take it as a given that “the west” should be ready and willing to provide them with whatever they require when they need it: funding for their endless “projects,” junkets to conferences, research fellowships, lectureships, etc. You might wonder why a grassroots activists or an opposition politician would need a research fellowship. Most real activists and politicans don’t need them, in fact. But the “struggle” in Russia has generated a rather large academic cottage industry of researchers and “activist researchers,” supposedly engaged in studying the “struggle,” the country’s “social movements,” and so on. By all means, whenever possible, “the west” should fund this research, too. Russian intellectuals—unlike Syrian intellectuals, Iraqi intellectuals, etc., (do “Islamic terrorists” even have intellectuals? )—are entitled to this support because, in mysterious ways I cannot even fathom at this point, they “share the same values” as “westerners,” whoever they are. Here’s the kicker. While western leftists and other assorted kooks have imagined “the west” has been doing Satan’s work and trying its darnedest to dismantle the once-mighty socialist utopia, the real story has been that the west actually has been flooding the former Soviet Union and Russia in particular with all manner of aid to civil society, academia, and even governments. This extends even to the US State Department, rightly condemned as the source of all evil in the known universe. There is probably not a single person in the current Russian government and parliament who has not been the beneficiary, at some time in the surprisingly recent past, of an all-expenses-paid fact-finding junket to the US and/or the EU. A rather large number of Russian law enforcement officers and judges have also been on such trips to the Great Satan, as I know for a fact. You might argue this kind of aid is ultimately self-serving, and you would be right. It was and has been mostly premised on the crazy notion that Russia was a democracy, and the west just needed to give it a little help and practical advice to get it all the way to the premier league of democracy, so to speak. In the historiography of the Soviet Union, an important breakthrough was made when a new tribe of then-young historians started doing something that subsequently became known as “revisionist” history. That is, they dared to look at the Soviet Union as something other than a nonstop Stalinist totalitarian nightmare, meaning they tried to examine how ordinary Soviet citizens perceived their society or periodized the country’s history to show how very different the Stalin era was from the Thaw, and so on. We are in desperate need of a revisionist history of the recent past, meaning the 1990s to the present. I realize no serious historian believes in “histories of the present,” but it’s good to attempt such things anyway, if only to preserve parts of the present or the near past that will not be so obvious to the people who come after us. What I have in mind most of all is the very successful attempt to hypnotize the whole world into believing what I call the standard narrative about the collapse of the Soviet Union, its aftermath, and the rise of Putinism. Remarkably, the standard narrative is shared by Putinists, anti-Putinists (especially leftist anti-Putinists,) and lazy western academics and journalists alike, that is, by people who would seem otherwise to be at odds in the present when it comes to interpreting Russia’s current morass or, alternately, “resurgence. The upshot is that everyone has forgotten that, during the “savage nineties,” Russian politicians, Russian society, Russian media, and ordinary Russians were not all reflexively anti-American and anti-western. Nor were they necessarily pro-American and pro-western. To know that, it helps a great deal to have actually been here to witness it, as I was. This is not to say that nothing the west and the US did at the time (I’ll leave it you to make up your own lists of those things) had any impact on life in Russia. What I do mean to say is that impact was never so critical as to make inevitable the period that followed, meaning the Putinist period, in which the country’s ruling elite has been engaged, from day one of the post-Yeltsin, in an all-out “cold civil war” (a term coined by a friend of mine) against ever more numerous and ever larger segments of Russian society. However, throught both periods, western governments, including the US, and western organizations of all kinds have been keen to promote democracy, civil society, academic research, and culture in Russia, and have spent a good deal of time, energy, and money on that mission, premised, mistakenly or not, on the notion that Russia was a society not so different from our own societies. I realize I am deliberately emphasizing the positive side of this relationship and practically ignoring the darker, negative sides of this effort. I am doing so for two reasons. One, I really do believe the positive has outweighed the negative. Two, I think the real challenge for serious “new revisionist” historians of the recent post-Soviet past would be to not take the standard narrative as a given, because once you do that, I would argue, you are a short slippery slope away from full-blown Putinism, which in Russian hipster leftist discourse usually has been camouflaged by a rather dubious take on post-colonialism, namely, that “the west” has attempted to “colonize” post-Soviet Russia, that would make all the pioneers of post-colonialist theory turn over in their graves, that is, if they are not still alive and happily theorizing among us. The flipside of this wholesale sellout to the Putinist standard narrative, paradoxically, is the widespread belief that “the west” owes each and every Russian a personal debt either for screwing up their country so badly or, conversely, for not doing enough to make it a full-fledged democracy. So, having spent millions and billions of dollars and euros, and thousands and hundred of thousands of manhours doing our best to help our wartime ally take what we all thought would be a tiny, natural, easy step in the right direction, we are now universally reviled (and revile ourselves) either for attempting to divert Russia from its unique historical trajectory or not doing enough to divert Russia from its uniquely catastrophic historical trajectory. Concomitant to this “porridge on the brain” (kasha v golove) is the equally widespread and equally false notion that “we” (as if “the west” were a real thing, a monolith centrally governed by me or the Rockefeller family or my Uncle Duane) have not been paying enough attention to “victimized,” “colonized” or “resurgent” Russia (cross out the words that do not apply) both in terms of journalistic coverage and academic research. In fact, Russia has had so much attention of all kinds lavished on it in the last thirty years, I would wager that, in terms of character counts, minutes of airtime, column inches, and so forth, it would easily outdo all other parts of the so-called non-western world, China included. In reality, nearly all those groups of Russians with big messages for the imaginary Big Brother have been furiously shuttling back and forth across the frontier for a long time now, wearing a large furrow in the carpet. This brings me to my non-intuitive and unforeseen conclusion, which would seem to be at odds with everything I have professed and done over the last nearly thirty years. What if “we” (although “we” know don’t really exist, but “they” don’t know that, even though “they” don’t really exist, either) just gave up altogether on our nonexistent collective project to befriend Russia or bring it to its knees by begging it fecklessly not to turn into a tinpot kleptocracy. With all the time, money, and manhours freed up, “we” could engage with other parts of the world or take up other worthy pursuits. What does this have to do with Russia? Absolutely nothing at all. And that’s my point. I think it would have a tremendously invigorating effect if “we” (who don’t really exist) disengaged from Russia altogether, if only because we need to deal with our own ailing countries or other traumas, joys, and dreams pestering our souls. And also because solidarity, as I have been harping on for years, is a two-way street. There was a time, in the nineties, when I thought I could see that two-way street being built. It has long ago turned into a one-way street, however, and whatever “we” do do and whatever “we” do not do, “we” are damned and condemned and reviled and told “we” are not doing enough. That is, “we” are in what Margaret Mead’s less-famous but equally distinguished husband Gregory Bateson called a double bind.